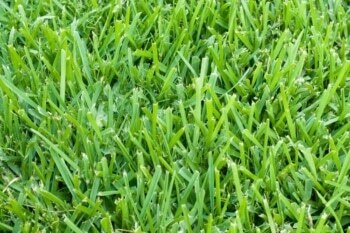 If you live in the southern United States, you may have St. Augustine grass – known scientifically as Stenotaphrum Secundatum. Many people enjoy this grass for its excellent ability to grow and thrive in both tropical and sub-tropical climates. It is typically spread via stolons (creeping, horizontal stems), and often referred to as runners because the plant spreads by creeping along the topsoil. The stolons grow and weave together, forming a nice carpet-like ground cover. If cared for correctly, you can expect a bed of St. Augustine to grow and stay healthy for many years. St. Augustine grows thick and prefers shaded areas. As a warm-weather grass, it does need at least 3-4 hours per day of direct sunlight in order to thrive. A healthy amount of warmth and light are ideal for this grass breed. When using fertilizer, insecticide, or fungicide, it’s best to use a high-quality broadcast spreader. This method allows even distribution throughout the lawn, while reducing direct human contact with the chemicals. The right tools for this task can make yard maintenance far quicker and simpler, so be sure you’ve got access to good equipment. A quality ‘weed-and-feed’ fertilizer is essential for combating weeds without compromising your healthy lawn. This is a special type of fertilizer that kills the weeds while promoting grass growth, which is a great way to maintain the purity of your St. Augustine grass. Using plug sod (also called a sod plug) is effective for filling in bare spots in your lawn spread. It can also be purchased and installed as pallets. Check your turf regularly and use plugs or pallets when necessary, to create an even carpet of grass. When mowing your grass, leaving the clippings behind helps cultivate a healthy lawn. As they decompose, the clipped blades act as a slow-release organic fertilizer, providing the ground with a high amount of nutrient return. Your St. Augustine spread will thank you for the self-nourishment. In the summertime, St. Augustine grass needs extra water to thrive and survive the heat. Though this species loves the warmth, it is advisable to water your lawn two to five times per week. This schedule allows your grass bed to produce long, lush green blades throughout the season. For additional info, check out our watering guide. Growing St. Augustine in your yard doesn’t need to be a task, so long as you’ve got the right tools and good information on how to care for it. If you want more information on how to keep your St. Augustine looking its best, reach out to professionals and fellow gardeners. They’re the best people to chat with for helpful and effective lawn care. My husband and I noticed we have a small patch of St. Augustine Grass growing near the end of our backyard. We are now wondering if it would be possible to spread this grass throughout our yard. I am not sure if it can grow with the other grass or we would have to uproot the other grass and plan new grass of the same variety. Any advice?